Template responsive 100%. Full compatible with Drupal 7.37. Simply to use. A lot of ad agencies have mediocre web design, while others have too complex, difficult to perceive sites. 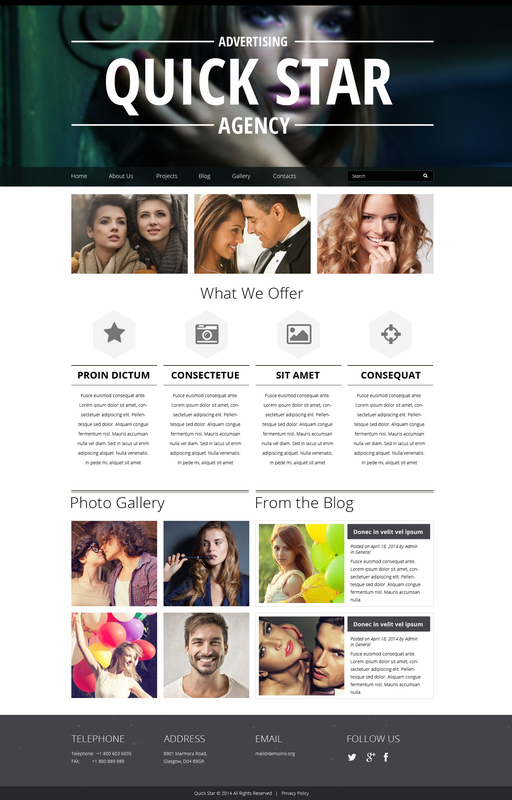 This theme is something in the middle, featuring impressive animation that does not interfere with using your site. Since the main goal of any commercial is to grab attention and draw more clients to a brand, using this design you will be able to communicate your business ideas perfectly and impress users with creative, eye-catching projects you have developed. This user-centric theme will hardly leave anyone indifferent because its vivid proto galleries, a welcoming slider and catchy projects round-up appeal to the audience and trigger excitement. Once people reach such an impressive website, there will never be a particle of doubt in your professionalism and out-of-the-box thinking.